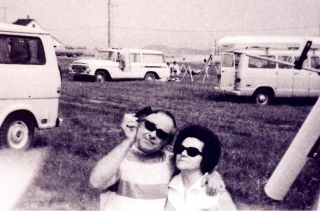 Space.com skywatching columnist Joe Rao took a road trip to Canada with his grandparents to see the total solar eclipse of July 10, 1972. For most of us, there are special events in our lives that will stay with us forever; in our minds, we can vividly recall something that happened many years ago as if it were only yesterday. And this year, Monday (July 10) will mark an auspicious personal anniversary for me: 45 years will have passed since I witnessed my very first total solar eclipse. (Interestingly, the 1972 event also fell on a Monday). As a teenager, Space.com skywatching columnist Joe Rao traveled to Cap-Chat, Quebec, to see the July 10, 1972, total solar eclipse. On Saturday morning, July 20, 1963, my grandfather pulled me aside and told me that there would be an eclipse of the sun later that afternoon. I had a vague notion of what an eclipse was, since a couple of summers earlier, we watched an eclipse of the moon. But an eclipse of the sun was something altogether different. So, a couple of weeks shy of my seventh birthday, I got my first lesson in celestial mechanics when my grandfather walked over to the kitchen shelf, grabbed the salt-and-pepper shakers and placed them on the kitchen table. He then told me to think of the salt shaker as the moon and the pepper shaker as the Earth. And then, using his clenched fist to represent the sun, he demonstrated, by lining up the three, with the salt shaker in the middle, how that afternoon, "the moon was going to get in the sun's way," and block out most of the sun's face. Unfortunately, the weather turned unsettled that afternoon. It was very hazy and humid, and clouds predominated much of the time. In the New York area, depending on where you were, the clouds played hide-and-seek with the eclipsed sun. About 2,500 people had periodic views of the solar-lunar spectacular from the Empire State Building's 86th floor observation deck. In other parts of the city, only fitful glimpses of the eclipse were possible. And from my vantage point, in the Throgs Neck section of the Bronx, we were close to being shut out altogether. On our porch, we had a radio that was tuned in to a local station that was broadcasting eclipse reports live. At 5:44 p.m., the announcer switched over to a reporter in Bar Harbor, Maine, where the eclipse was total. At the exact moment of the total eclipse, just as the reporter shouted into his microphone "What an amazing sight!" the sun dramatically broke through the clouds in the Bronx, ever so briefly revealing to us a silvery crescent sun triumphantly shining through a thick canopy of clouds. It could not have lasted more than 10 or 15 seconds before the clouds covered the solar sliver and effectively ended our eclipse watch. But that was a life-changing event. That night at dinner, Grandpa mused that it was a mistake to stay in the Bronx to see just a partial eclipse. "We really should have gone to Maine where that guy on the radio was," he said. "Then we could have seen a total eclipse." He then told a story about how, at the age of 16, he witnessed a total eclipse of the sun from the Upper East Side of Manhattan on a frigid January morning in 1925. "It was the most spectacular thing I ever saw," he said. "I'd love to see another one someday." The next day's newspapers were filled with eclipse stories, and all said the same thing: The next total eclipse of the sun over the United States would be on March 7, 1970. Florida was one of the places that was mentioned most often; to see a late-winter total eclipse from there sounded like a very inviting proposition to Grandpa. "Make a note on the calendar," he told me. "We're going!" Over the next seven years, while I was waiting for the eclipse, I became increasingly interested in the world of science, especially astronomy and meteorology. One Christmas, I received a telescope and a Spitz Junior home planetarium, and I was regularly giving sky shows in my bedroom for friends and family. At school, I was posting the daily weather forecast on the blackboard in home room. And by the time 1970 rolled around, I had become an enthusiastic amateur astronomer. I was ready and eager to see my first total solar eclipse. The clouds parted just in time for Joe Rao to see the July 10, 1972, total solar eclipse. But during the opening weeks of 1970, Grandpa developed a hoarseness in his voice that became chronic. The diagnosis was throat cancer. He was told that the surgery (laryngectomy) offered him the best chance of survival. The operation occurred on March 6, 1970 — the day before "E-day" — at St. Vincent's Hospital in Lower Manhattan. The next day, New York again saw a partial eclipse. When I visited Grandpa later that day, he reached for a slate and scrawled, "DID YOU WATCH THE ECLIPSE?" I instantly knew the answer: Monday, July 10, 1972, over Quebec and Canada's Maritime Provinces. He wrote, "WE'LL BE THERE!" And smiled. And true to his word, we were. Grandpa quickly recovered from his operation, mastering esophageal speech by bringing air up through his diaphragm and "belching" out his words. For viewing the eclipse, I chose the town of Cap-Chat, Quebec (pop. 2,100 in 1972), primarily because of its accessible location on the south bank of the St. Lawrence River, its proximity to the middle of the totality path and relatively favorable weather prospects. Grandpa drove the 800 miles (1,300 kilometers) in his beat-up Plymouth Fury. Accompanying us were my mom, sister and grandmother, whom we called Nanny. All of us were excited about the prospects of what we were going to see, except Nanny. "Why would anybody drive such a long distance to see it get dark for a couple of minutes?" she kept asking as we trekked north. We made overnight stops in Montreal and Quebec City, and very early on July 10, we made the final push to Cap-Chat. We left early because we were worried we might encounter traffic jams. As we all piled into the car just after sunrise, Grandpa studied the leaden-gray sky and frowned. "It looks bad," he said. But soon we moved out from under the clouds and began seeing increasing sunshine and blue sky. We traveled along the Gaspé Peninsula on Canadian Route 132, driving through quaint towns laid out across hillsides with the clean red-brick simplicity of a modern railroad village. But we saw very few people. Nanny chuckled as she asked, "Are you sure this is the right day?" However, once we moved into the path of totality, the number of people and telescopes grew exponentially with each passing mile. The neighborhood around Cap-Chat was densely crowded with people from all parts of the world who had come to see the eclipse. One estimate, probably very conservative, had at least several thousand people within 5 miles (8 km) of the town. To me, Cap-Chat resembled a French version of the fictional town of Mayberry on "The Andy Griffith Show." Interacting with the countless visitors who were walking the streets was akin to being in the waiting room of a maternity ward: Strangers would come up to us and ask, "Is this your first?" Nanny — who honestly believed we were going to be the only ones on this crazy journey — tried to take it all in, but still couldn't quite believe her eyes. The first page of Joe Rao's 1997 story in Reader's Digest, which describes his experience of viewing the July 1972 total solar eclipse. But so did the clouds. In fact, at the moment the sun disappeared, it was behind a cloud. The clouds, which moments before were battleship gray, now took on eerie shades of saffron and salmon. I remarked that, although we couldn't see the sun, the striking colors on the clouds were a nice "consolation prize." Then, about 30 seconds into totality, the sun suddenly appeared through a small, unexpected hole in the clouds. The clearing fell silent, except for Grandpa, who kept repeating, "It's just like 1925." We now had a view of the sun's corona, a delicate fringe of pearly white light. Nanny uttered, "Oh, look! That is beautiful!" Our 134 seconds of totality seemed to race by. Then, suddenly it ended, heralded by a small but intense solitaire of sunlight, creating a "diamond ring" in the sky too dazzling to look at it. Cheers greeted the return of the sun, which was promptly swallowed again by thick clouds. We were lucky, for back in Cap-Chat, just a few miles away, those same clouds had eclipsed the eclipse. Late that night, back in our hotel room in Quebec City, my grandfather, weary from all his driving, said, "I bet you'll remember this day for as long as you live." He was right. I would never forget that miraculous day, or the man who had awakened in me a deep awe of the universe. Many people who are reading this now will likely be experiencing their very first total solar eclipse exactly six weeks after my eclipse anniversary. I'm sure there will soon be countless new stories to tell. 1963, has a direct connection to the upcoming "Great American Eclipse of 2017" on Aug. 21. I'll explain that link in a future column.